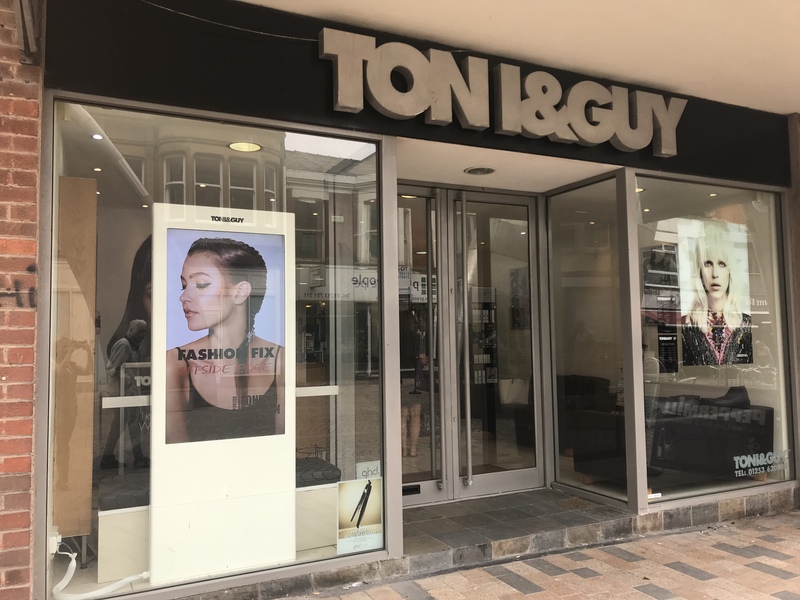 TONI&GUY Blackpool opened in 2001.As a salon we pride ourselves on delivering the highest standard of customer service to each and every client. Our talented team of stylists and technicians are on hand to give you expert advise and create hair that is individual and easy to live with. Incorporating fashion trends with versatile wardrobe styles. Members of our colour team hold the prestigious Wella master colour expert accolade, their knowledge and expertise available to advise you on the latest colours and techniques. We also offer Wellaplex as an upgrade on your colour service. We offer many additional services including relaxing Hair Spa treatments including a fragrance hot towel. Bridal and occasion hair, Nanokertain smoothing system and YUKO hair straightening. For more information on our services please speak to our friendly receptionist team who will be happy to help. I received a nano keratin treatment which in total was around 4 hours. During this time Alison was extremely considerate, attentive and chatty (but not overly so that would make me uncomfortable). The experience is as important as the finished product for me and both were great, my hair looks and feels fantastic. Glad you enjoyed your recent visit with us! Thanks so much for taking the time to review us, we really appreciate your 5 STAR feedback. Not been to this stylist before and she really listened to what I wanted. Will be back. Thank for taking the time to review your most recent visit with us for cut & blow dry with Senior stylist Alison, it's so great to learn you feel satisfied with the overall service you received. Just want to day a massive thank you to Alison for my amazing hair treatment today. She made me feel really comfortable as soon as I met her, she was very polite and took great care of me. I left feeling super super happy with everything that I had done, a cut and blow dry, an Indian head massage and Alison applied some amazing treatments to my hair. Absolutely love my hair so much, and I will definitely me returning in a couple of months to see Alison again. So pleased you enjoyed your visit to the Salon earlier this week. It's really great to hear you felt relaxed and comfortable and indeed are loving the results!! Thanks so much for taking the time to review us, your lovely comments will be shared with Alison & the team. I had full head of high/low lights on short bob, cost just short of £150. My main issue was covering grey hair. The grey wasn't covered, I returned and asked if anything could be done. More colour put in which was fine. I was made to feel extremely uncomfortable, I didn't understand what the stylist was attempting to explain why it didn't cover the grey, I told her I didn't understand and she suggested another stylist explained it to me. Very patronising, very awkward. Its a lot of money to pay for a colour which had to be redone. Will not return. Very poor customer service. So sorry to hear you feel disappointed with the result of your recent visit with us, and that you feel the customer service you received wasn't up to our usual high standards.I'll be in touch ASAP to rectify the situation. So glad you enjoyed your recent visit with us for both colour & cut & blow dry services, wonderful to hear your loving the overall results too! Thank you for taking time to review us. Lovely lady, really pleased with the colour. Alison explained everything to me at the start. So pleased you enjoyed your recent visit with us. Many thanks for taking the time to send your thoughts, we really appreciate the feedback. As per usual, lan worked his magic. Lovely salon. Really happy with my hair cut. Stephanie listened patiently to me and the result is just what I wanted. I will deffinately be going back. So pleased that you enjoyed your first visit with us for cut & blow dry with our senior Stylist Stephanie, great your loving the overall results too. Many thanks for taking time out to review your experience. Darron listened, and gave me the most wonderful haircut. Friendly service too. Will be back soon. It's great to hear you enjoyed your visit with us this week for cut & blow dry with Darron, really pleased you enjoyed the salon experience we offer. Thank you so much for taking the time to send us your thoughts, we really appreciate the feedback. It's great to learn you enjoyed your most recent visit with us for your colour with Senior Technician Alison. Many thanks for taking the time to send us a review, we really appreciate the feedback! So pleased to learn your loving the results of your new Hairstyle created by our style director Kelly, glad you enjoy the salon experience as a whole! So pleased you enjoyed your recent visit with us for cut & blow dry with our style director Kelly. Thank you so much for taking time out to send us your thoughts & lovely comments, I'll be sure to share these with Kelly & the team! Once again Ian did not disappoint and I'm very pleased with his work when I need a cut or wanna do anything to my hair I always make sure it's with Ian. So glad you enjoyed your recent visit with us for your haircut with Ian. I enjoy the experience,, I love the result... I get what I ask for ...Darron is very approachable ....a real nice guy . So pleased you enjoy the salon experience, it's always lovely to see you! Thank you taking time to send us your thought, we appreciate it. I’m not 100% sure whether the lady who styled my hair was called Steph but she had bright short-ish hair. I am very fussy with how I like my hair and Stephanie understood what I wanted and reassured me with what was possible given the circumstances of my current hair. She was talkative, helpful, attentive and very friendly. I have never walked out of a salon loving my hair but for the first time yesterday I loved it! I will definitely be returning to Toni and guy to have my hair cut and coloured by this lovely lady again! Couldn’t fault her! It's so great to know you enjoyed your recent visit with us for both colour & cut services with our senior stylist/technician Stephanie. So pleased your loving the results! Thank you for taking the time to send your comments. Really pleased you enjoy your visits to the salon. It's always lovely to see you & look forward to seeing you later in the week for your scheduled blow dry. Thank you for taking the time out to send us some feedback. Really pleased you enjoy the overall experience we offer and that you leave feeling relaxed! First class hair stylist, with a superb eye for detail. Great to learn you enjoyed your recent visit with us for hair cut & style with Darron, So glad your happy with the result. Thank you for taking the time to review us, your feedback really is appreciated. So pleased you feel really happy and pampered during your visits to the salon and are loving the results of both colour &cut services.